Owner’s Name Richard Hurley, Michael Heaton, Harley Moffatt, David Paranthoiene, Gary Smith, Ralph Wilson. 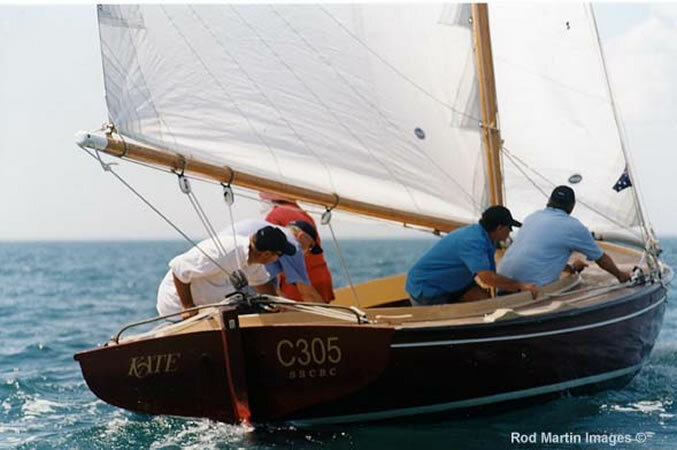 Kate was designed by Ken Lacco from a brief by Bill Davis and was the second Couta Boat built by Tim Phillips of The Wooden Boat Shop, Sorrento. His first boat was Sally (1982). Kate was commissioned in 1983 and launched in October 1984. She was the first Couta Boat to be built in The Wooden Boat Shop’s, Clarke Shed. Although Kate was built faithfully to Ken Lacco’s plan’s, Tim and Bill designed and built her shallower in the bow section than was typically done at the time. The result is a slender and slightly narrow hull with a fine water line producing good upwind performance. Kate is a petite boat being only 25’ 11 ¾” and is one of the smaller 26 footers racing in Division 1. Her sail rig is proportionately smaller too. She has always been presented with burgundy topsides with a white boot-top and a black bottom. Kate was named after Bill Davis’s mother who unfortunately died during the year of her build and was unable to witness her launch. 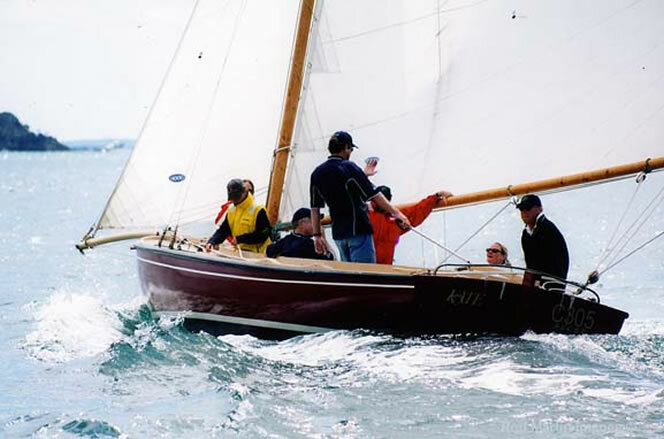 Her sail number C305 derives from when she was first registered, then at Royal Brighton Yacht Club where Bill was a Member and later became C305 when she was entered in the Couta Boat register. During Bill’s ownership Kate was maintained by Tim Phillips of The Wooden Boat Shop. Her sails were made by Col Anderson of Hood Sails. Bill sailed Kate throughout the 1980’s. 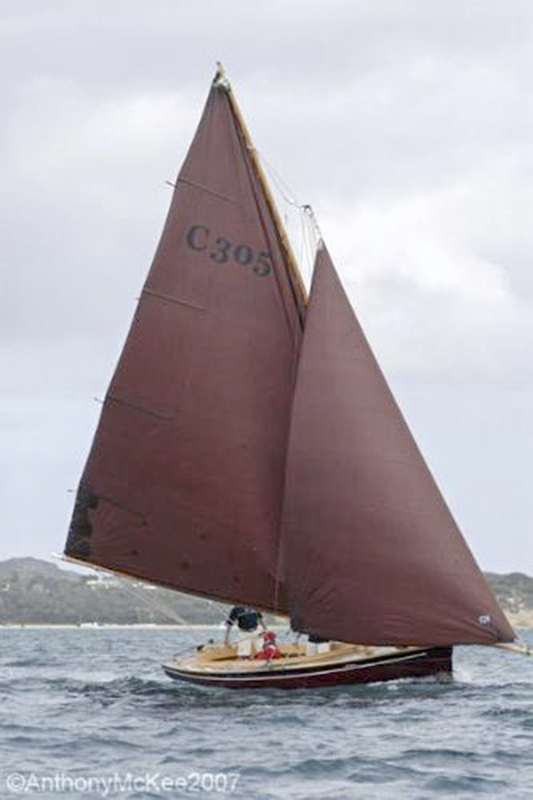 She played a significant role in the rebirth of the Couta Boat fleet. 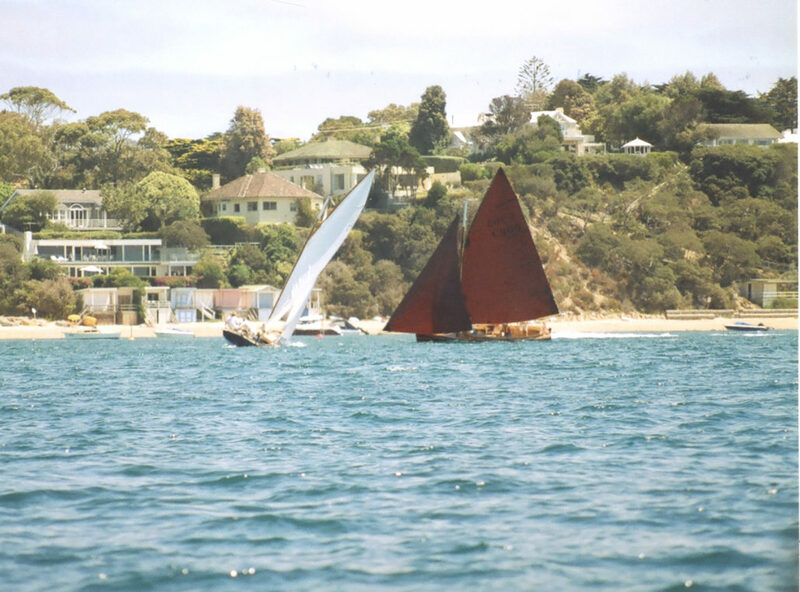 In her early days she was moored at Fisherman’s Beach, Portsea, later off Lentel Ave., Sorrento and then in 2001 she was moved to the Sorrento Sailing Couta Boat Club (SSCBC) when the Couta Boat Club and the Sorrento Sailing Club merged. Her mooring was maintained by Mullies, Sorrento. Bill’s regular crew comprised Russell (the “Budgerigar’) Evans, James Mort, Rick Marshall and Gerry Sheahan, amongst others. In the early days of the 1980’s Couta Boats typically used cruising cloth fabric for their sails. Although inexpensive to purchase, such fabric easily stretched. Bill became tired of having Kate’s sails re-cut several times each season so he had Col Anderson of Hood Sails make him a set using NYT fabric, the same as used in the Etchell racing yachts. These new sails were cut with a small radial in the head sail. The result was a Line Honours and Handicap win for Kate in the 1988 Portsea Cup. Needless to say the fleet soon followed Bill’s initiative adopting the NYT high performance sail cloth for themselves. During Bill’s ownership, Kate won the Lacco Shield (twice); Cameron’s Bight Couta Boat Race Trophy, 1st on Handicap; Walter Todd Memorial Trophy, 1st on Handicap; Couta Boat Club President’s Trophy; and the Portsea Cup, both Line Honours and 1st on Handicap. 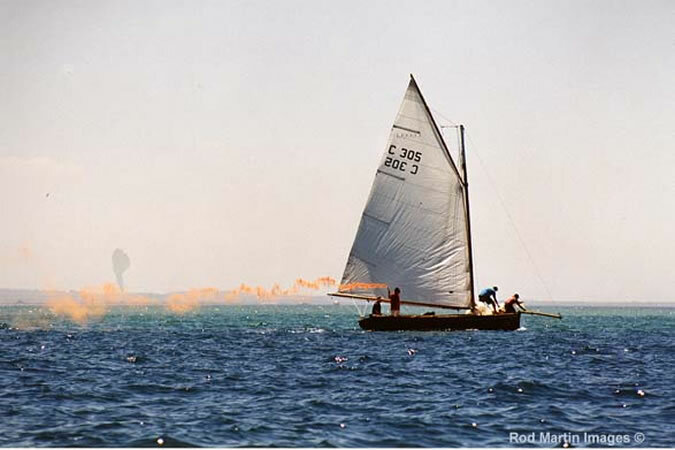 In 1989 Bill sold Kate to his friend Warick Leeming who with his wife Sue and family members Mathew, Adam and Felicity and friend David Todd sailed and most successfully campaigned her throughout the 1990s. During Warick’s ownership Kate continued to be maintained by Tim Phillips at The Wooden Boat Shop, Sorrento and her sails were made by Col Anderson of Hood Sails and mooring maintained by Mullie’s of Sorrento. 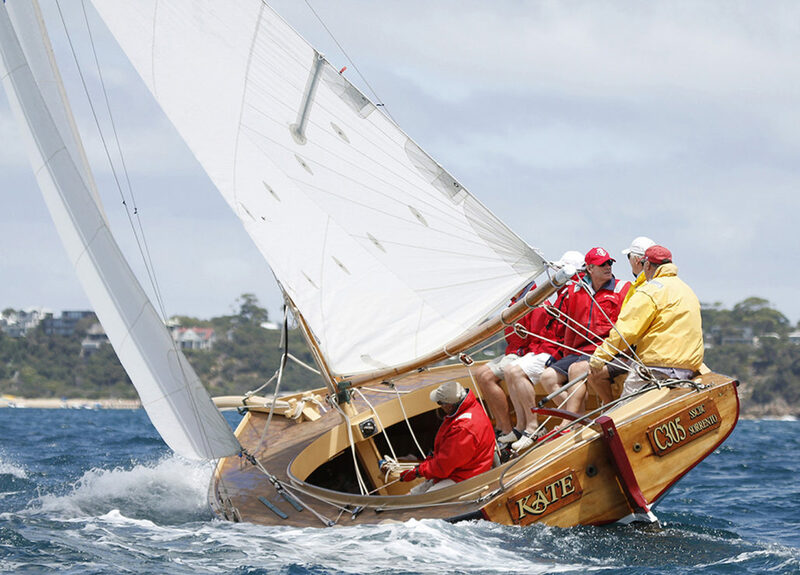 Kate participated in the bicentennial regatta in Sydney in 1988, and also spent 1999 and 2000 in Sydney moored at Double Bay and was slipped at the CYCA. During this time Kate also spent some time at Pittwater, and sailed up the Hawkesbury River, under the Pacific Highway bridge and well further upstream. Under Warick’s ownership she raced all over Port Phillip off Portsea, Sorrento, Rosebud, Mornington, Brighton, St Kilda, Williamstown and Queenscliff. Race records show that with Warick, Kate won many races including the Portsea Cup, Line Honours; Gellibrand Trophy, 1st on Handicap; Couta Boat Club President’s Trophy; Williamstown Cup, Gaffed Rigged and Fishing Boat Regatta, Line Honours (twice); Lady’s Skipper Race Trophy; Queenscliff Regatta Trophy, Line Honours (twice); Walter Todd Memorial Trophy, 1st on Handicap (twice); and the Gellibrand Trophy, 1st on Handicap. In 2001 Warick sold Kate to a syndicate of three; Michael Heaton, Richard Hurley and Ralph Wilson who were long standing Members of the Sorrento Sailing Club (now Sorrento Sailing Couta Boat Club) but relatively new to the skills and enjoyment of Couta Boat sailing. 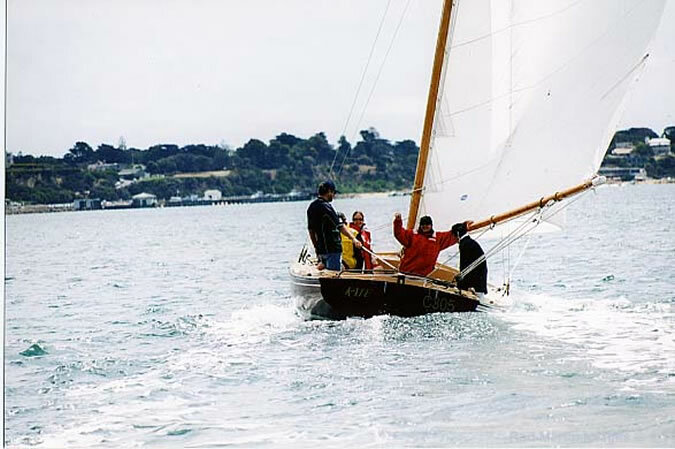 In the early days of their ownership, like the owners Bill and Warick before them, their children and friends enjoyed sailing and racing Kate. The syndicate of three soon increased to include Stephen Silk (since retired from the syndicate) and Gary Smith and later, David Paranthoiene and Harley Moffatt joined. She was maintained by Ian Cockman when he started Nepean Boats, Rye and later moved to Mark Abbott when he opened Corsair Boats, Rosebud. During this period her sails have been made by Col Anderson at Hood Sails, Mark Rimington at Doyle Sails and UK Sailmakers, and Sam Haines at North Sails. She continues to be moored out the front of the SCCBC jetty. Her mooring is maintained by Greg Fink of Peninsula Underwater Services. 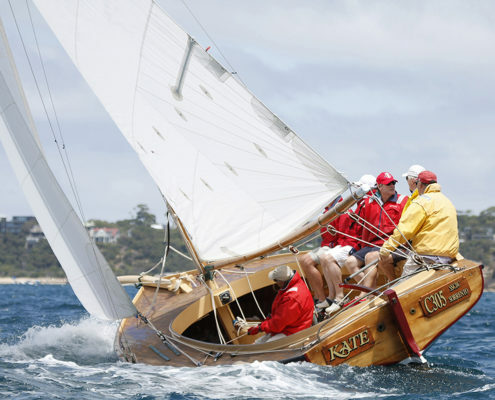 The Kate syndicate has enjoyed good racing success wining the Portsea Cup, 1st on Handicap (4 times); the National Championships, 1st on Handicap (twice); the Walter Todd Memorial Trophy, 1st on Handicap and the Club Aggregate Club Champions 1st on Handicap. Kate still looks as pretty today as when she was first launched. 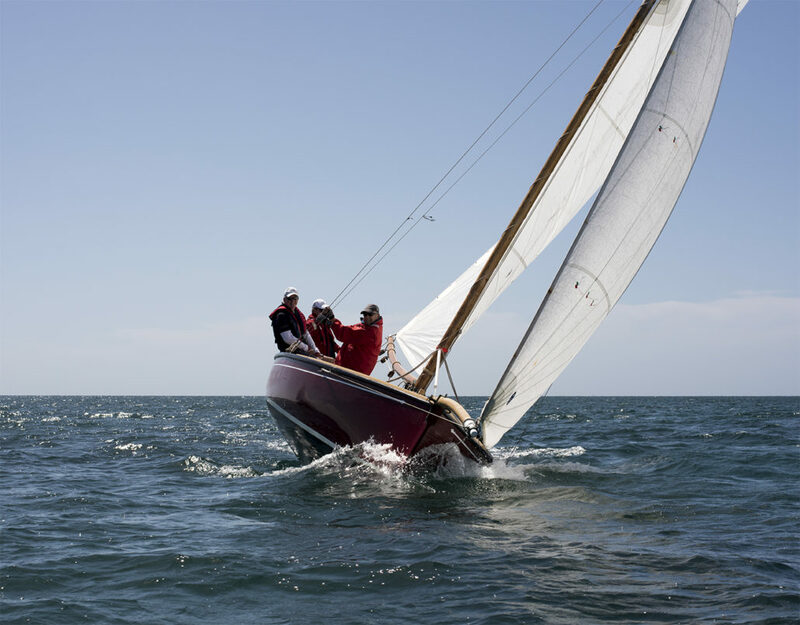 Her rigging plan remains unchanged out of respect for her heritage, being one the first of the modern Couta Boats and is regarded by many today, as one of the prettiest in the fleet. Kate has won many races during her racing career, with many more placings (not listed here) to her record. 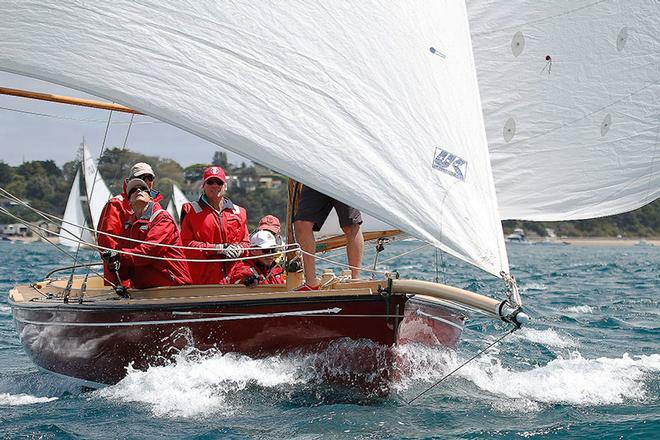 She remains one of the top performing 26 foot Division 1 handicap Couta Boats racing today.